The Incredible Hulk has been popular enough over the years to remain in one form or another on television and later the movies. There have been numerable adaptations of the character. Included are several animated television series in the 1960s and then in the ‘80s and ‘90s.The Hulk first started out in animation as part of the Marvel Super Heroes animated television series in 1966. The 5-10 episodes were shown and were based on the early stories appearing in both Hulk and Tales to Astonish comics. Then in 1978 CBS first aired its new live-action series “The-Incredible-Hulk”. As most are well aware of, this series starred Bill Bixby (My Favorite Martian) as Dr. David Banner and champion body builder, Lou Ferrigno, as Banner’s alter ego, the Hulk. The name change from Bruce Banner to David Banner is unclear though. But rumor had it that one of the network executives thought that Bruce might have had vaguely homosexual overtones. 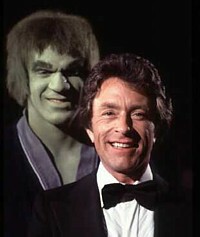 The series ran from 1978 to 1982 and was by far, the most popular TV adaptation of the Incredible Hulk. The format was similar to “The Fugitive” which was also a very successful series. Although, becoming very popular, the series story line had little in common with the character’s development in the comic books. But it appears that this version of the Hulk is most recognizable in the pop culture of today. The elaborate (at least for the time) transformation sequences yielded the popular catch phrase of David Banner’s “Don’t make me angry, you wouldn’t like me when I’m angry”. This phrase became very associated with the character of the Incredible Hulk. It originated from the TV series though, rather than the long running comic book series. It is amazing what mass media can do, isn’t it? The Incredible Hulk spawned several made-for-TV "reunion" movies in the late 1980s and early 1990s. They often featured the Hulk being challenged by another Marvel character (Thor and Daredevil in particular). The last of these films took the surprising step of killing off David Banner in its conclusion. Despite this, there were plans to bring him back from the dead when Bixby himself died (in 1993) and no further Hulk reunion films were considered. After the show had ended in 1982, the Hulk returned to cartoon format. He aired with Spider-Man and His Amazing Friends in a combined hour. 13 episodes of this series were produced, which was generally more faithful to the comics than the live-action series. More of the comic book characters, such as Rick Jones, Betty Ross and General Ross appeared. This animated series was not greatly successful. Typical of many "superhero" cartoons of the era, the show used a series of stock transformation scenes, which include Banner transforming back with his clothing somehow restored and intact. The She-Hulk and the Leader made an appearance in the show. Notably, this series (as well as the Spider-Man cartoon of this era) featured the voice of Stan Lee as a narrator. In 1996, UPN brought the Incredible Hulk back to animated form again. This time Lou Ferrigno returned to add his voice to the Hulk. The show had a mixture of the comic books and the live action TV series. In 1997 the show's name changed to The Incredible Hulk, and She-Hulk was featured in several episodes along with the Gray Hulk. The Hulk also appeared in a Fantastic Four animated episode. At that time, Ron Perlman voiced the Hulk. You may remember Ron from The Beauty and the Beast TV series and later he was cast as the Hollywood version of Hellboy. He fights the Thing in the episode called "Nightmare in Green." In 2003, Ang Lee directed a film based on the Hulk for Universal Pictures, which was released on June 20, 2003 to mixed reviews. The movie featured Eric Bana as Bruce Banner, Jennifer Connelly as Betty Ross and Nick Nolte as David Banner (Bruce's estranged father). The Hulk himself was a computer-generated imagery effect. Lou Ferrigno and Stan Lee shared a brief cameo in the film as security guards. Personally, I thought the cgi effects creating the Hulk were great. The computer generated character brought a since of realism, which integrated quite nicely with the real actors. I had to purchase the DVD to add to my comic book character DVD collection. It is fun to pull out and watch every now and again. Although the first movie wasn’t a blockbuster, it apparently generated enough interest to spawn a second movie. Rumor has it that Universal and Marvel Enterprises are working on the sequel, Hulk 2. February's Total Film magazine features some new information from Marvel's Avi Arad. He confirms that Hulk 2 is in progress, and a few intriguing changes that will be made from the first film. "In the next movie, Hulk 2, the Hulk will be smaller. If you make him 15-feet tall, there's no human connection there.....Right now we are still developing the sequel. I think the key thing is to come up with the right story." The article also says we are promised, 'less angst and a lot more Hulk smashing,' and that Bruce Banner will become more comfortable with his big green side. 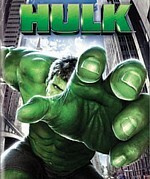 It appears that the next saga in the life of the Incredible Hulk will be released in 2006 or 2007. Any bets on when it will become viewable to us hungry fans? And to learn more about the Hulk, you can return to my first Incredible Hulk page. You may very well find a tidbit or two worthy of your interest. And of course, the ole standby, Amazon has a few items to tickle your taste buds. Just click on the image to the left. Don’t stay too long though, and come back here. If you want to keep up on the varied and interesting activities going on in the world of comic books, then feel free to sign up for my newsletter “Comics Galore” in the form below. And by all means, I would love to hear if you are anxiously awaiting the next Incredible Hulk movie. You can sure tell me at my contact page in the menu at the left. I may even be able to include your comments in my newsletter. I thank you ahead of time.